The Future Strategy Club is a RADICALLY TRANSPARENT members CLUB That aims to replace the fat cat CORPORATE agency with a scalable ecosystem of creative talent and refocUS the agency around craft, quality & care once more. Welcome to A SCALABLE ECOSYSTEM of the best talent. The Future Strategy Club is a members club built from a unique scalable ecosystem of agency services executed by the best talent in the business, and managed and assured by the Club. This dynamic managed network delivers craft, quality and care at a greatly reduced cost through three curated member groups- Partners, Advisors and Specialists. Welcome to a new type of AGENCY - A CLUB. We believe profits for our members are an output of a fanatical adherence to our principles, our partnerships with our members, and our purpose. Our values do not stand in the way of their profits, they give us the capability to do great work with great people for the greater good and deliver all our members profitability over the long-term. Our values - craft, quality, care - are the bedrock of who we are and how we behave as company and as individuals. Building long-term partnerships based on trust and mutual success with our members is the cornerstone of everything we do. We are a for-purpose company and we aim to never wander from the founding vision - the success of our members and our community over the longterm. The Club doesn’t price projects based on the client’s revenue, size, budget, what we can get away with or any other dark art. 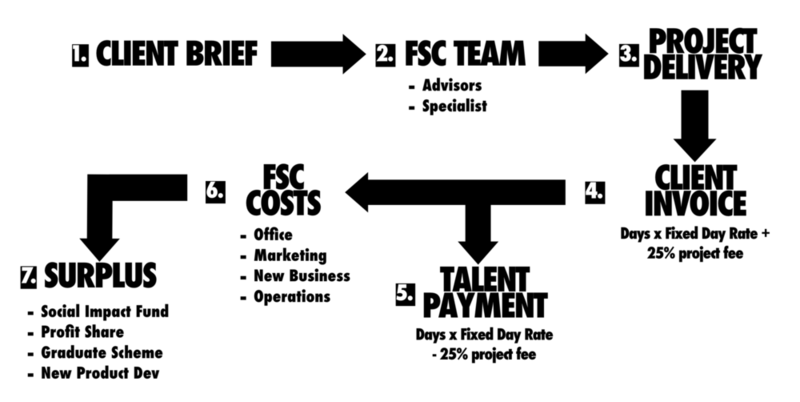 The Club is radically transparent around what it charges clients, how much it pays talent, and its operational costs. And profits are redistributed to its members and re-invested in The Club. Welcome to A CLUB WITH AGENCY. Nothing changes without execution. Agencies without the ability to execute deliver fluff, and consultancies without the creativity to innovate deliver iterations of today. What is needed in these disrupted times is something different with the capability to execute world class innovation. What is needed is a club with actual agency. Through our Exec Change Board and Execution Network we pull the right expertise into the right project at the right time to guarantee the quality of the thinking and the execution for our members. Welcome to a NETWORK of talented executors. Welcome to a board of proven change experts. Disruption comes from the most unexpected places. Keeping ahead of disruption, and driving the appropriate change to counter the threat of the disruptor, necessitates a very senior and very cross-industry exec level board of expertise. The Future Strategy Club Expert Advisor Board provides the exact experience and thinking to every change challenge . Welcome to 20 years experience. Our methodologies and ways of working have been honed over 20 years of industry experience working with FTSE & Fortune 100 companies across all sectors, and are solely focused on helping organisations with the continuous change they need to be driving at their cores. 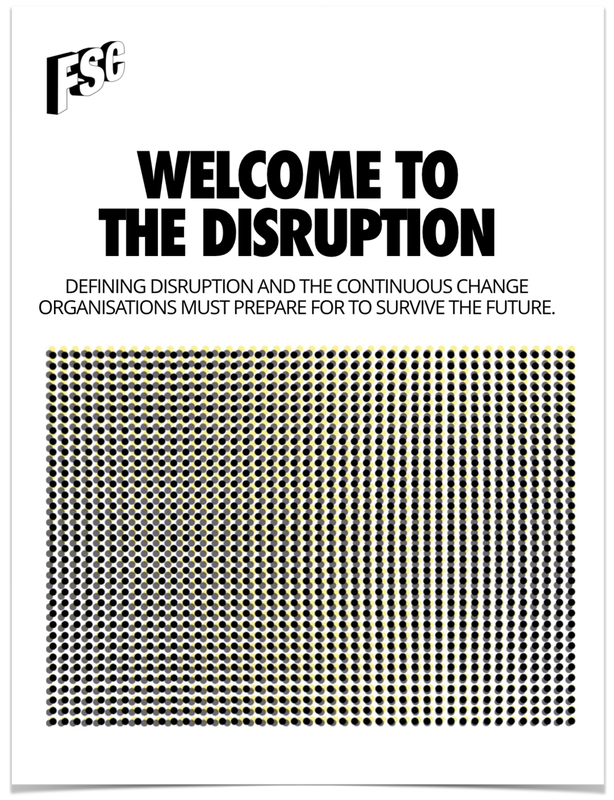 As a Disruption Club we need to be constantly playing at the edge in order to be able to identify new trends, thinking and theory for our members. The best way to do this is to be part of that future through the publication of interviews, articles and thought leadership from the best future thinkers and doers we can find. 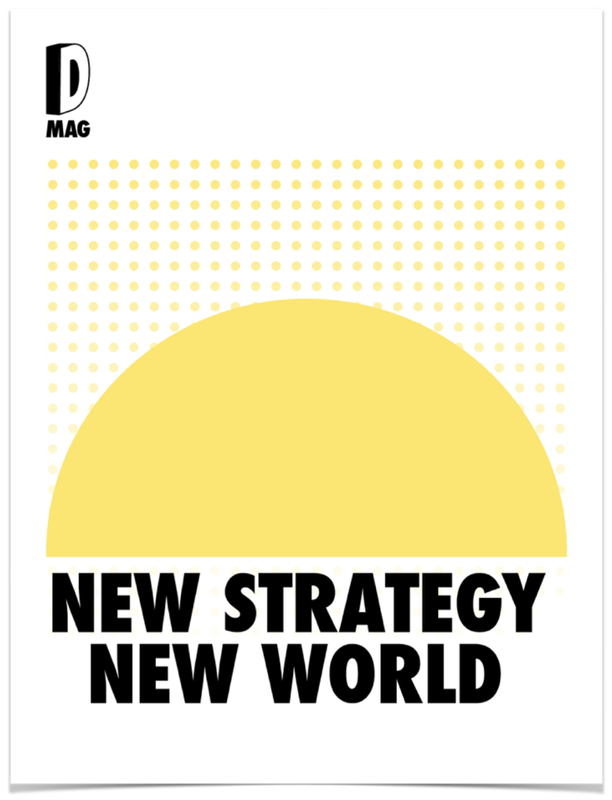 DMag is a new magazine from The Future Strategy Club focused solely on disruption theory and practice across all industries. Disruptors, disruptees and experts share their knowledge and strategies helping our members prepare for their futures. Our whitepapers are in-depth research publications that dig deeper into emerging trends and disruptive technologies. They aim to uncover new insights and strategies and provide intelligence input into our members’ innovation and transformation programmes. 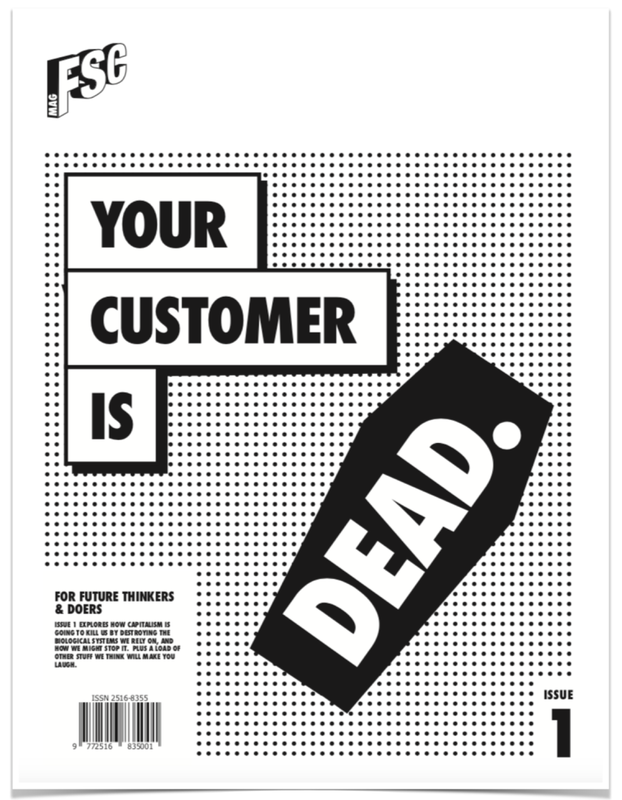 Billed as the punkish love-child of Private Eye and HBR - the FSC Mag is an alternative to the rather corporate, stale and pompous creative industry mags already out there with a heady mix of in-depth future thinking, cynical piss-taking and original funny stuff that may make you laugh. We aim to be a force for good in the world. Not only do we choose our members carefully to make sure we are not doing harm, we put a percentage of our revenues into social impact projects. We want to use the capabilities of our frameworks and tools, the talent and power of our members, to do good. Not all of our initiatives will be successful, but we will keep trying to do good until we do good. Ten Green Bottles (www.tengreenbottles.org) is a sustainability consultancy that uses the power of local communities to build innovative solutions to waste, in order to accelerate the move to a circular economy. Ten Green Bottles believes in the power of communities and consumers to affect change nationally, and wants to harness local strength to make a global difference, and begin the journey to more sustainable business models. Unpackit (www.unpackit.uk) is a behavioural change campaign to convince lunchtime office workers to reduce the plastic pollution of their lunches through moving from one use to reuse by bringing their own lunch container. The UK alone produces more than 170m tonnes of waste every year, much of it food packaging. Some of it is poisonous, and some of it never degrades. Thumbs up for sustainable toys. The Green Kid (www.thegreenkid.org) is a sustainable toy certification ‘kitemark’ to help parents and children identify and avoid toys that damage the environment. We aim to change parents and children's attitudes to toys through targeted 'toy stunt' campaigns, in-school education and the promotion of sustainable toys. Customer1 (www.customer1.world) is an early stage startup to make aggregated brand sustainability data available to customers at the till in the form of a sustainability score (SUS Score). Via a platform, it will allow customers across the world, at the same time, to form Virtual Momentary Customer Power Groups and make buying decisions together. Give a little, save a lot. 20%Green (www.20percentgreen.com) is a pro bono creative talent platform to help kick start new green ideas and support current ones. Using the spirit of Google’s 80/20 innovation time rule - but applying it to our free time instead of work time - we want to encourage creative talent to give 20% of their non-work time to a green project.